There are thousands of colleges and universities of all sorts and sizes in the U.S. The college search to identify where you will apply can be exciting but also very daunting! When I was applying to college, I was intimidated by the sheer number of schools. But it wasn’t until I actually began researching colleges that anxiety really struck. How could I know what school was right for me? What should I choose? Would I be chosen?? The research process doesn’t have to be overwhelming, but it is important. Too often, the college search is interpreted as looking up a school’s rank on U.S News. A lot of students fixate on schools that top these charts, equating a high rank with a school’s desirability. The "Any Ivy League School" mentality is not only incredibly risky, but also a flawed strategy because each school is unique. Every Ivy is incredibly different, so it’s highly unlikely that all of them would be a good fit for a single student. School research is so much more than prestige and low acceptance rates. The college search process should revolve around what fits your passions. In the midst of applications stress, it's easy to forget that through the college search process, you're also picking a place where you’ll live for the next four years. Don't want to be too far away from your family on the East coast? Then take Pepperdine off your list. Hate cities? Look for schools in quintessential college towns, like University of Vermont in Burlington, Vermont. Love to ski? University of Colorado could be a great place to pursue this hobby. Setting boundaries on geographical location and campus environment are two of the easiest ways to instantly narrow your college search and make the process more manageable. Unsure of the schools that exist in the places you love? Unigo can help you search for colleges by state, and College Board can help you search for schools that are within a specified radius of your home. Want to feel out a school’s environment from your couch? eCampus tours has over 1,300 college tours for free, and many schools offer virtual campus tours on their own websites. Not only should you think about where you want to spend the next four years of your life, but you should also think about the people you want by your side! Stats can tell you many aspects of the student body and culture. Is the student body diverse? Does Greek life dominate? Do sports and athletics play a big role at this school? Campus visits will be the best way to assess student culture for yourself, so try to visit a range of schools. Do you feel like you jive with the students? Can you see yourself as part of the community there? Capitalize on your campus visit by chatting with students, and attending student Q&A sessions. On the other hand, if you want to take a look at the UC schools but you’re just too far away, make sure you take advantage of college fairs. High school college fairs are a super convenient way to chat with representatives about student life (typically these reps went to the school themselves, and can give you a firsthand account). 3. What are Your Future Plans? If you have specific ambitions about what you’d like to do beyond college, then analyze pre-professional programs throughout your college search. If you are immovably attached to becoming a nurse, good for you! You should definitely consider such programs, and be aware that many schools do not offer pathways to achieve this goal. While Northeastern and Georgetown have nursing schools, for example, Dartmouth does not. 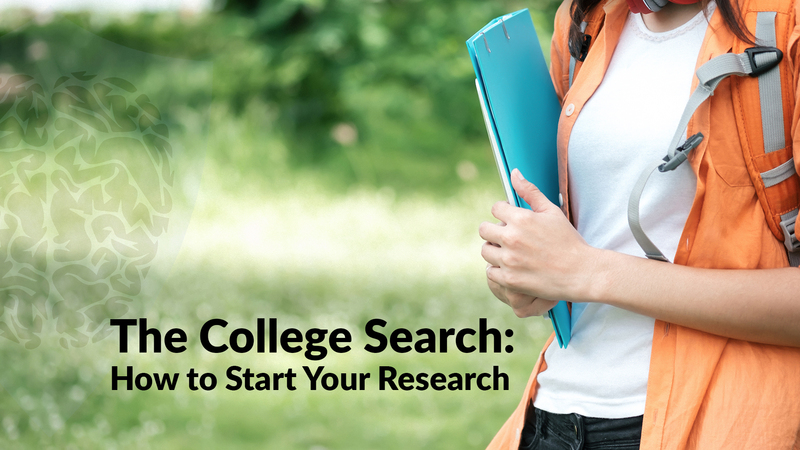 Many college search platforms, like Niche, help you narrow schools down according to major. From there, you can look at individual schools’ websites to really get a sense of how each program operates. On the flip side, if you have no idea how you envision your career, flexibility should factor into your research. Universities with separate applications for programs like “engineering” or “business” or schools that require you to declare your major as you apply may not be for you. Liberal arts schools are more flexible, and might be better suited for you. While it’s exciting to think about all of the possibilities while you conduct your college search, you’ve got to be realistic. Let's not forget how competitive top colleges are these days. Take a mathematical look at Stanford, for example. With an admissions rate at less than 5%, Stanford rejects a whopping 95+% of students. Every year these denied applicants include valedictorians and students with perfect SAT scores. That's why it is crucial to have a balanced school list. A good school list should contain reach schools where you're stretching yourself, fit schools where you will probably get in, and safety schools where you are very confident of your chances for admission. Tiering your school research is worth the time because it should ensure that you'll end up at a college where you can be happy. Defining reach, fit, and safety schools will be different for every student depending on their grades, scores, and extracurricular accomplishments. To give you a broad sense, schools with acceptance rates below 25% are typically reach schools for anyone. A school with a 50% acceptance rate or lower would be a fit school for most, and all schools with acceptance rates above 75% are typically in the safety range. Facts and figures pages on universities’ websites will typically provide acceptance rates, and so does College Board’s search engine. Looking for a more personalized sense of what are reach, fit, and safety schools for you? Check out College Kickstart - input your numbers and this platform will generate the likelihood that you’ll get into the schools on your list. Bottom line: the college search should be fun! It’s a chance to systematically envision many possibilities for yourself. Start the research, and you will discover that among the long list of colleges in the U.S., there are many that could be the right school for you (and many that might not be a good fit). Even if Harvard is your dream school, there are lots of other schools where you would thrive. Kick-start your college search process today!